Mamani Mamani is an Aymara artist from Bolivia. 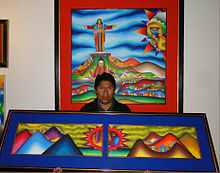 His work is significant in its use of Aymara indigenous tradition and symbols. His art has been exhibited around the world, including shows in Washington, D.C., Tokyo, Munich, and London. Roberto Mamani Mamani in one of his galleries in La Paz, Bolivia. Mamani Mamani's paintings draw upon his Aymara heritage, and include colorfully stylized images of indigenous mothers, condors, suns, and moons, among other themes. Mamani Mamani uses strong vibrant colors similar to the colors featured in the traditional handmade weavings that are widely used by the indigenous people of the Bolivian Altiplano. His use of indigenous symbols is especially significant in the South American context where indigenous cultures have been viewed as inferior to European culture. In 2016, he made murals at the walls of the Wiphala social housing complex, located in El Alto. Wikimedia Commons has media related to Aymara. ^ Gompf, Andrea (24 March 2016). "Bolivia's Most Famous Aymara Artist Decorated New Social Housing Project With 12-Story Murals". Remezcla. Retrieved 23 April 2016. This article about a Bolivian painter is a stub. You can help Wikipedia by expanding it.